Housing, as a built realm and one of the main sources of consumption in the Self Sufficient Neighborhood, is a topic that varies around the world by its size, type and condition. As we started to discuss about housing layer of the neighborhood, we classified our research and strategy to two parts. First, the physical structure which refers to its size and number of bedrooms, and second,the social structure, which brings up the question of household types and their relationship with their dwellings. The two diagrams below are references to physical aspect of our research. 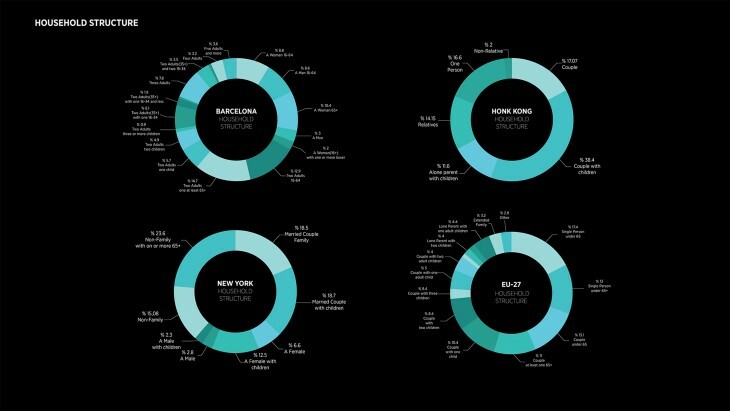 The first diagram shows the different amounts of residential space per person around the world. It is evident that, the countries that have higher density, have smaller amount of residential space per person. For Example, Honk Kong and Italy have 15m2 and 31m2 residential space per person respectively, while Australia and Canada have 89m2 and 72m2 residential space per person respectively. A similar condition is also obvious when it comes to average new home sizes around the world. Average new house size in USA is 201m2, which is much higher than the average new house size in Europe, such as Italy (81m2) and Spain (97m2). One of the main reasons for this disproportion is the large detached single-family houses in the suburbs of American cities. As they have more have space to build, houses gets bigger and consumes more of natural resources. In contrast, as European cities get denser because of the high rate of urbanization, and the houses gets smaller, which becomes the main reason for the disproportion of the sizes between different countries. After the research of different averages for the house sizes around the world, it was crucial to find the global standards for norms for the housing units of the Self Sufficient Neighborhood Prototype. The two standards that we took into consideration were UK Standards and UN Healthy Housing Guide 1988. In terms of the requirements for the size of the apartments and the number of people who can live in those apartments, the standards of UN Healthy Housing Guide 1988 is at its minimum and very outdated. On the other hand, it was more appropriate to use the standards of UK since it is the most updated and optimized compared to older standards. However, in some cases, we also had to optimize some of the standards to manage the density of the people and quality of living in the units of Self Sufficient Neighborhood Prototype. A similar research that was done for the physical aspect of the housing layer for the Self-Sufficient Neighborhood Prototype, another research that we have done, is the social aspect of our neighborhood. The second part of the housing research is about the type and distribution household structures around the world. The research has started with the selection of different metropolis around the world, which represents differentiation of social behaviors in terms of household structures. The cities that were picked are Barcelona(Europe), New York City(America), and Honk Kong(Asia). We also researched the European Union(27) average household structure to understand the common household concepts in Europe and the relationship within each other. Different household structures have different housing needs and requirements in a relation with their social and physical structure. The housing units of the Self Sufficient Neighborhood is categorized in three parts; Family Housing, Shared Housing and Tourist Accommodation. Each of them consists of different apartment types with different household structures. Family Housing units contain couple with children, single parent with children and couple. Shared Housing units consists of people, who could normally live alone but share apartments in the Self Sufficient Neighborhood. These people are between 16 and 64 years old, 65 years old or older, and students. They live in 5 bedroom and 7 bedroom shared apartments. Half of the need for tourist accommodation is achieved by hotel rooms, and the other half is by couples in 2 bedroom apartments, who rent the extra bedroom in their apartment. 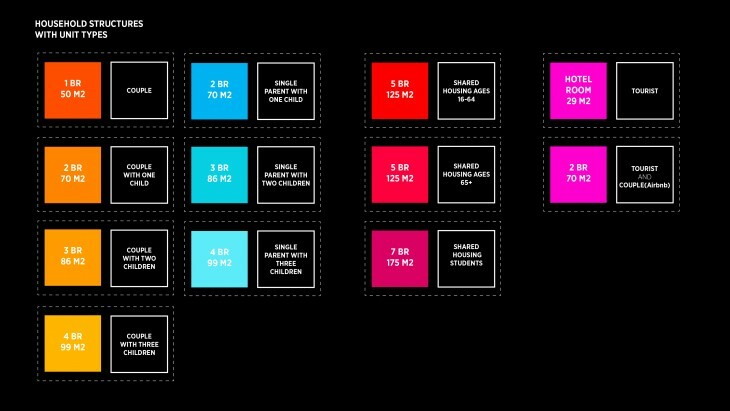 As you can see the diagram on the left, the distribution strategy is different for each housing category. Family Housing units are located closer to green spaces and more pedestrian areas. On the other hand, Shared Housing and Tourist Accommodation units are located around the perimeter which is more urban and closer to public transportation. Only exception in shared housing is the apartments for 65+, which exists closer to central green spaces and more pedestrian areas. 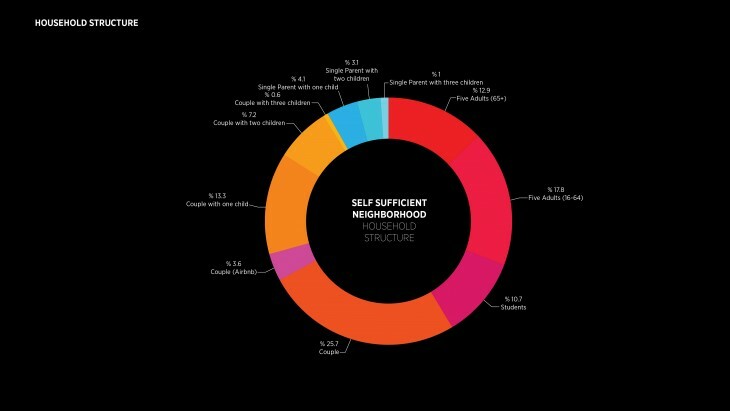 In conclusion, the Self Sufficient Neighborhood Prototype inhabits 25,000 people in 8453 units, which equals to 804,604 square meters of residences. The average households size is 3.0 and residential space per person is 32.2 square meters. The housing layer of the Self Sufficient Neighborhood is realized with three main strategies, shared housing for single person households, mixed typology of housing blocks, and hybrid buildings.